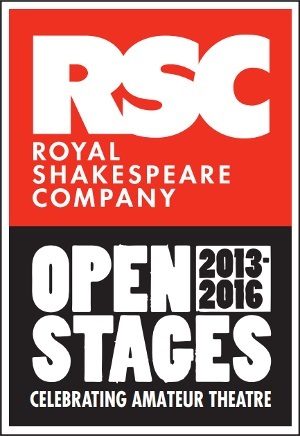 Theatre in the Square was delighted to be chosen to be part of RSC Open Stages 2013-2016. 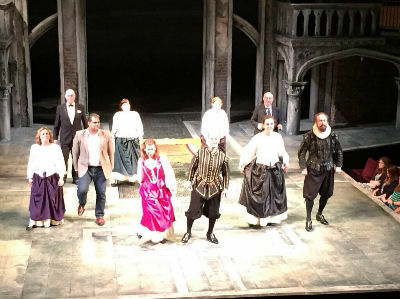 This has been a very exciting project in which the Royal Shakespeare Company has been mentoring and providing training to nearly 90 amateur companies around the country, as they have staged their own Shakespeare and Shakespeare-based productions. 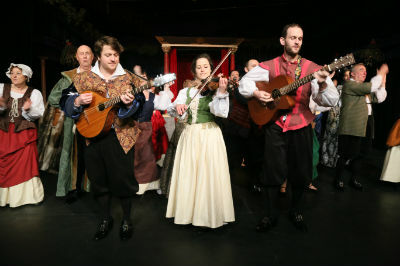 The London companies involved were also partnered by The Questors, the largest community theatre in Europe, for training and skill exchange workshops (both acting and technical). Here is a short film that was made at the initial weekend for the Open Stages directors in Stratford in September 2013. Click on the image to run the clip. The writer/director for our show was Jane Jones who also wrote and directed our last Shakespeare show 'Love Lust and Lies', performed in May 2013. In her new show, 'What She Will', she explored the women in Shakespeare’s real and imagined worlds, as told through the eyes of his wife Ann Hathaway. Here is the trailer for 'What She Will', which was made by Jonah Maddox for the group. 'What She Will' by Jane Jones. Based on the works of William Shakespeare. from Jonah Maddox on Vimeo. The production was performed at the Bridewell Theatre in Blackfriars in March 2015 to full houses. The cast then went on to perform an extract from the play at the regional Open Stages showcase at Questors theatre in London in July 2015. Much to TintS' delight this extract was then chosen to be performed at the national Open Stages national showcase at the RSC in Stratford-upon-Avon in August 2015.